Gricoski Funeral Home here in Frackville is traditional in the sense that you'll feel the hospitality and support you expect as soon as you enter. But that's where the comparisons end. 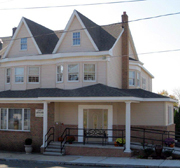 In addition to open and comfortable sitting and visitation rooms you'll also find that Gricoski Funeral Home has. Plus, we understand how trying funerals can be for younger visitors. That's why you'll find a children's play area with books, games and other activities for the kids. Gricoski Funeral Home not only has helpful onsite amenities, but our location is also in a calm, residential neighborhood. That means you'll find peace and quiet here - something you might not find with other area funeral homes. Gricoski Funeral Home is also near many Frackville churches and cemeteries so you're never too far away. If you're looking for a funeral home that provides facilities and services for visitors of all ages then Gricoski Funeral Home is worth examining, so contact us today.